I can show you just how easy it is. 29 June at my house and make your own! Bring a friend or two along for support. & nibbles and a fun afternoon of giggles. I will also have the new 2014 Annual Catalogue to peruse which will not be available online until 2 July! Card 1 – Crisp Cantaloupe & Pistachio Pudding: These gorgeous Secret Garden stamps are teamed up with two of the new 2013-2015 In Colours from Stampin’ Up! 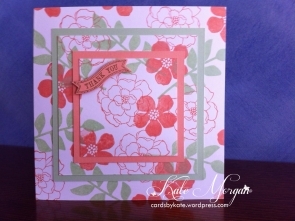 Card 2 – Raspberry Ripple & Gumball Green: Secret Garden stamps with two of my all time favourite 2011-2013 In Colours from Stampin’ Up! Be sure to book your spot at my Workshop. 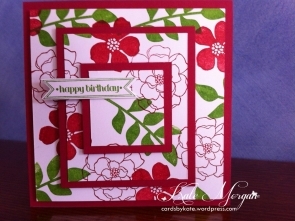 Have a Stampin’ good day!